In July 1997, The Karmapa Charitable Trust, the legal body given responsibility for Rumtek Monastery by H.H. the 16th Karmapa, filed a lawsuit against Tai Situ Rinpoche and Gyaltsab Rinpoche. The Karmapa Charitable Trust sought justice in the courts after Rumtek Monastery was violently taken over by Situ Rinpoche and Gyaltsab Rinpoche on August 2nd 1993 with the help of then-Chief Minister of Sikkim Nar Bahadur Bhandari. The case lingered in the courts for several years while legal arguments were conducted. 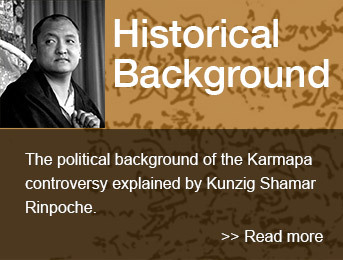 In 2002, the District Court ruled in favor of the Karmapa Charitable Trust. The case was appealed to the High Court of India, where in September of 2003, Situ and Gyaltsab Rinpoches lost once again. They lost for two reasons. Firstly, Situ Rinpoche and Gyaltsab Rinpoche were unable to prove they had any legal right to take over Rumtek Monastery. Secondly, Situ and Gyaltsab Rinpoche lied too many times to the court. As lies piled up, each lie would contradict the next. In the end, Gyaltsab Rinpoche asked if a settlement could be reached between himself and the Karmapa Charitable Trust. The Chief Executive Trustee, Kunzig Shamar Rinpoche, agreed to a settlement proposal consisting of seven points. 1. To conduct another inventory of the Rumtek relics, including the Vajra crown. 2. If any relics are missing, Gyaltsab Rinpoche, for his own part and also as representative of Situ Rinpoche, must inform the court where they are hidden, sold or where they may be located. 3. To make a public apology that the two rinpoches illegally took over Rumtek Monastery. 4. When Rumtek Monastery was taken over, more than two hundred monks were living there, most of whom were forcibly evicted. Fourteen monks remained and collaborated with the two rinpoches. Those fourteen would be allowed to stay but the rest of the people that Gyaltsab Rinpoche brought to Rumtek and who currently still live there must leave. 5. Compensation for the two hundred monks who were forcibly evicted must be provided. The amount should be 50 rupees per monk, per day, for eleven years. This amounts to about 40 million rupees, or about one million dollars. The amount is negotiable. 6. Situ Rinpoche and Gyaltsab Rinpoche must pay all court costs. 7. Gyaltsab and Situ Rinpoche may never return to Rumtek. Gyaltsab Rinpoche was prepared to accept all of these points except for the two requiring compensation, points numbers 6 and 7. But then Situ Rinpoche summoned Gyaltsab Rinpoche to New Delhi. At this meeting, Situ Rinpoche convinced Gyaltsab Rinpoche that they should not accept Shamar Rinpoche’s terms. Doing so, Situ argued, would be no better than losing the case in the court outright. Therefore, in spite of having already lost in two courts, in early March 2004, Situ Rinpoche and Gyaltsab Rinpoche appealed the case to the Supreme Court of India. A final decision by the Supreme Court is expected in July 2004.